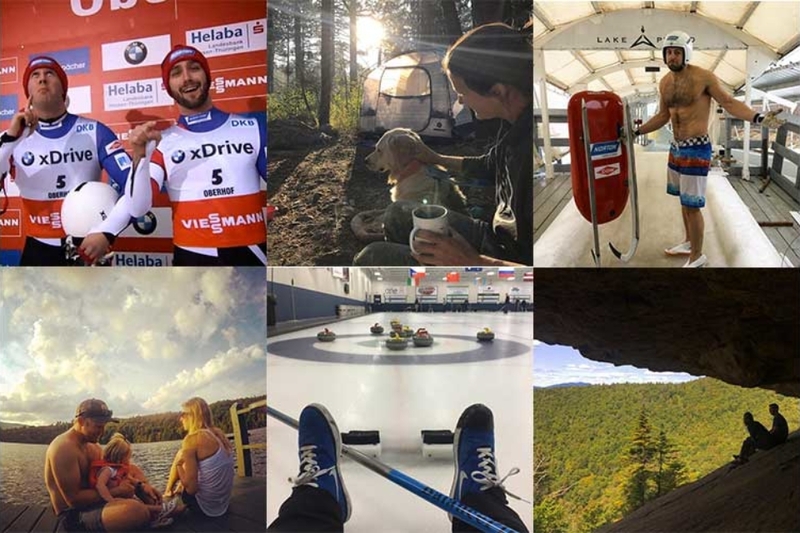 All of the photos here come from the athletes’ own Instagram accounts and are used with their permission. Credits below. Update: Athletes with an asterisk (*) next to their names had been named to Team USA as of January 31. To watch the games, check this live-update schedule for event days and times then consult your local TV listings, an online streaming schedule, or a mobile app, all courtesy of NBC. Note that competition begins February 8, one day before the opening ceremony. Blood, sweat, tears, and fresh air: The outdoors has played a pivotal role in the careers of these 17 Olympic hopefuls from AMC’s region. Learn how then watch them compete when the 2018 Winter Games kick off in PyeongChang, South Korea. CROSS-COUNTRY SKIER FROM STRATTON, VT. When I’m not training, I’m in the mountains. How has the landscape of the Northeast shaped you? I will be forever grateful for the place I grew up, rural southern Vermont. The access and exposure my siblings and I had to the outdoors was incredible. We spent countless hours catching frogs in the pond, creating make-believe kingdoms and tree forts in the woods, and going on hikes in Vermont and New Hampshire. Our neighbors own the nordic center down the road, Wild Wings, and we could ski to the trails from our house. My siblings and I learned how to ski about the same time we learned to walk. The rest is history! What’s your AMC connection? If we’re running Franconia Ridge, we always stop in [the huts] for some water refills and snacks. Last summer my cousin, boyfriend, and I did the Presidential traverse, and the huts made that adventure much more enjoyable! SNOWBOARDER FROM WEST DOVER, VT. When I’m not training, I’m out on my road bike. Who is your Olympic inspiration? Snowboarding became an Olympic sport in 1998. I recorded the event on a VHS tape and watched it after school. I decided that day I wanted to give my life to becoming an Olympic snowboarder. How has the landscape of the Northeast shaped you? Getting out on the mountain was what we looked forward to most as kids. Growing up in a small mountain town in Vermont got me ready for any snow or weather conditions and made my foundation and fundamentals strong. When I’m not training, I really enjoy riding my road bike or hiking. Who is your Olympic inspiration? Growing up, Tara Lipinski and Michelle Kwan. Before completely pursuing skiing, I figure skated for hours on end every day, morning until night. How has the landscape of the Northeast shaped you? Growing up on the East Coast helped me tolerate cold weather, windy days, and icy terrain. Sounds like a negative statement, but in all honesty, these conditions truly helped shape me into the skier I am today. When I’m not training, I’m hiking or running trails. Who is your Olympic inspiration? Michael Phelps. How has the landscape of the Northeast shaped you? I’m from around Boston, and that’s where I grew up curling. My family has a cottage in Maine where I spent the majority of my summers and learned to love the outdoors. Moving to northern Minnesota for curling came easy for me, because the environment is parallel to that of Maine. When I’m not training, I’m gardening. Picking blueberries. Reading. Helping coach the juniors in our ski club. Beekeeping. Building and maintaining single-track mountain bike trails. How has the landscape of the Northeast shaped you? My favorite workouts are long runs or hikes in the Adirondacks near Lake Placid, N.Y., where the national team trains, or in the Green Mountains, near my home in Vermont. During my college days [at Dartmouth], I became very familiar with New Hampshire’s White Mountains, too. I like traveling light and being able to cover vast distances in a day. It’s an incredibly empowering feeling. There will be good, deep conversations if teammates are around. If I’m by myself, I find trail running very meditative and relaxing. The mountains are a good place to let all your thoughts ferment. What’s your AMC connection? I’ve stopped in AMC huts during many training runs and backpacking trips in the Whites. I was a member of the Dartmouth Outing Club’s cabin and trail division during my college years and helped lead trail-work trips to maintain sections of the AT. SKI JUMPER FROM WEST FAIRLEE, VT. When I’m not training, I’m hiking Smarts Mountain, farming, practicing archery, running with my dog, building something, gardening, stacking wood, or teaching someone to ski or ride a bike. How has the landscape of the Northeast shaped you? Growing up, I was outside every day. We had a saying: There is no bad weather, only bad clothing. No matter what, we always tried to get out the door for an adventure. Sometimes it was a short walk in Hanover to Velvet Rocks Shelter; other times it was a run up Moose Mountain, where we would see the first lady-slippers in the spring. The woods of Vermont and New Hampshire gave me confidence as an athlete. I knew I could deal with tough weather, long days, and challenging terrain. It gives me peace of mind to know, no matter my results, I will always be able to come home to Vermont; throw on my running shoes; and find mud, laughter, and good times on the AT. What’s your AMC connection? My grandma Lucy Blanton was a lifelong member of AMC and hiked the AT in segments a few times. The first big hiking trip I went on was when I was 7 with her and my mom, up Mount Lafayette. We stayed in [AMC’s] Greenleaf Hut for a night. I loved the four-story bunk beds. After the trip, I begged for a super-tall bunk bed in my room at home! FIGURE SKATER FROM NEWTON, MASS. Editor’s note: As of presstime, Gold had bowed out of competition. When I’m not training, I’m kayaking in Ann Arbor. I love to go hiking and be outdoors as much as possible. How has the landscape of the Northeast shaped you? I’ve lived in several different places throughout my life—Texas, Chicago, Los Angeles, Missouri, and currently Detroit—but the Northeast is one of my favorites! I loved being outdoors where I grew up, because you really got to see all four seasons. I loved the winters and the blanket of snow that would cover our yard. Apparently, my mom always wanted to take us skating on the frozen marshes of Boston, but my sister and I never wanted to. Funny how that turned out! What’s your AMC connection? When I was about 4 years old, my family and I took a few vacations to New Hampshire. I talked with my dad, and he’s 92 percent sure—direct quote—it was with AMC. I do remember how cold it was in New Hampshire and that all of the trees were frosted over with ice. I remember drinking hot chocolate every waking moment (a child’s dream), and my sister and I went sledding every day. When I’m not training, I’m paddling or biking. Who is your Olympic inspiration? I was obsessed with figure skating when I was little, so the Nancy Kerrigan- and Kristi Yamaguchi-era had me hooked on the Winter Olympics. I have always been inspired by all the backstories of athletes. Hearing how they got to where they are and where they came from was always very cool. How has the landscape of the Northeast shaped you? Having one of only two luge tracks in America two-and-a-half hours from where I grew up, in a rural area just outside Adirondack Park, definitely helped me get into the career I’ve had for the last 18 years! This region offers so much, with an abundance of ice and snow, and I’m very thankful to have been raised here. Having hills, forests, and mountains in my backyard that I grew up skiing, camping, and hiking in and later sliding down—with so many lakes and rivers—shows you the beauty of nature and makes you appreciate it. When I’m traveling in the plains, nowhere near a lake or trees, I get antsy. I feel so much better when I am back in a forest or the mountains! FREESKIER FROM WEST DOVER, VT. When I’m not training, I’m camping or outside with friends, playing everything from park games to summer volleyball. Who is your Olympic inspiration? Growing up on Mount Snow, Vt., I have always looked up to Kelly Clark. She grew up there and rode on the same mountain as me, so when she reached the Olympics, I knew it could be possible for me. She came and spoke at Mount Snow Academy when I was in school about her Olympic experiences, and it gave me goosebumps. How has the landscape of the Northeast shaped you? I always say, if you grew up skiing on the East Coast then you truly love skiing. East Coast conditions are hard, with the weather, ice, rain. I also believe it made me a better skier. Yes, I would have loved to get pow days with light, fluffy snow. But even if you get 2 inches of wet snow, you still want to go out and get the freshies. I learned how to ski on ice and use my edges. It made me tough, and I am so grateful for that! LUGER FROM SARANAC LAKE, N.Y. When I’m not training, I’m camping, hiking, climbing, cliff jumping, backpacking, canyoneering, and pretty much just being outside. How has the landscape of the Northeast shaped you? By providing me with snowy hills I could sled down as a child. Winter is practically half the year in northern New York, where I grew up, and one of my favorite activities as a kid was sliding through the apple orchards next to my house. In the winter, we would hike in the Adirondacks and always bring small plastic sleds to slide down the mountains, using snowshoes to help steer. I still love the mountains, and although I spend a majority of my time hiking out in Utah, I still have a soft place in my heart for the mountains of the Northeast. What’s your AMC connection? My mother thru-hiked the Appalachian Trail in 1986 and then joined the Berkshire Chapter of AMC in 1987. She served on the Berkshire Chapter leadership committee from 1987 to 1992 and was part of the chapter’s AT Committee. LUGER FROM HUNTINGTON STATION, N.Y. When I’m not training, I’m mountain biking, stand-up paddling, or fishing. Who is your Olympic inspiration? I am impressed by all the Olympians and Paralympians I compete with—and those who have come before me. I loved watching the Olympics growing up. It motivated me to be the hardworking and disciplined athlete I am today. How has the landscape of the Northeast shaped you? I can tell you that if I did not live in upstate New York for the past 15 years, my hobbies would be very different! I am originally from Long Island, which is a busy and populated place, [but] my time upstate introduced me to mountain biking, hiking, rock climbing, snowboarding, cross-country skiing, freshwater fishing, and paddleboarding. Mountain biking has become my primary hobby, and it’s extremely technical in the Adirondacks, which is great, because so is luge. Mountain biking helps me to work on focus, balance, coordination, body awareness, and speed control, and it’s a great workout on my non-lifting days. CROSS-COUNTRY SKIER FROM SHAFTSBURY, VT. When I’m not training, I’m hiking and swimming in the mountains and unsuccessfully fly fishing with my wife, Erika. How has the landscape of the Northeast shaped you? I like to joke with my western teammates that, out west, everyone lives in the valleys and looks at the mountains. In the Northeast, we literally live in the mountains. They are so accessible. I’m so grateful for growing up in Vermont, where adventures were always right out our front door, no matter what season it was. I was able to hike and ski at a young age. I can remember climbing Katahdin at about 12 years old and being up on Knife Edge, thinking it was so cool! I really loved the feeling of heights, and being up on a mountain didn’t scare me at all. If anything, the heights made me calmer, something I think we mountain people all share. What’s your AMC connection? I distinctly remember doing four nights or so together with my parents and two siblings in the huts along the Presidential Range. These kinds of trips are unforgettable—and probably pretty good endurance training, now that I think about it. I can’t wait to get back into the huts someday soon. FIGURE SKATER FROM CLARKS SUMMIT, PA. When I’m not training, I always love to go on a hike! Who is your Olympic inspiration? Michelle Kwan, Aly Raisman, Michael Phelps. How has the landscape of the Northeast shaped you? It’s where I got my start in skating. The cold winters are what got me to an outdoor rink in the first place. CROSS-COUNTRY SKIER FROM EAST MONTPELIER, VT.
Who is your Olympic inspiration? Growing up I always loved watching Picabo Street race. How has the landscape of the Northeast shaped you? I grew up sledding out my back door, alpine skiing at Burke Mountain every weekend, running all over the Northeast and adventuring in the mountains, playing in cold streams, and swimming in endless ponds and lakes. The landscape of the Northeast made me fall in love with the outdoors, which eventually led me to pursue an elite athletic profession so I could be outside as much of the day as possible! What’s your AMC connection? My family has been AMC members for years. I’ve used so many of the trails in the Northeast the AMC keeps in such great condition. LUGER FROM EAST STROUDSBURG, PA. When I’m not training, I’m golfing; swimming with my dog, Roxy; or playing softball. Who is your Olympic inspiration? My late grandfather James Maloney. Growing up, he always told me—and all my cousins—that we could do anything we set our minds to. He was a hardworking father of six who gave up his own sports career early to help his family when they were tight with money. His support in my dream never wavered, and I am truly grateful to have had him in my corner. How has the landscape of the Northeast shaped you? Living now in Lake Placid, N.Y., gives me a lot of options on how I do my daily training. On a cardio day, I can go on one of so many different hikes in the area. On shoulder-work days, I can grab a kayak or a [stand-up paddleboard] and go out on one of the lakes. The terrain allows me to have so many options at my disposal. And the views—well, it doesn’t get much better anywhere! ALPINE SKIER FROM LAKE PLACID, N.Y. When I’m not training, I spend as much time as I can outside, getting out on our many waterways in the Adirondacks, camping, fishing, and, when the season allows, hunting. Who is your Olympic inspiration? My family has always inspired me to be my best, and now that I have a one-and-a-half-year-old daughter, I feel like she expects me to do great things. Just kidding—but I do find a lot of drive in the general work ethic of my family. How has the landscape of the Northeast shaped you? I think my mother’s overwhelming love of hiking probably helped grow my appetite for excessively long training days—20-plus miles—at a young age. I really can’t say enough great things about the area and the gifts it has given me. I love it and I hope to always figure out a way to be here. Who is your Olympic inspiration? Wanting to win is my Olympic inspiration. My mom would be pumped if I say her. And she believes in me no matter what. So she definitely inspires me. How has the landscape of the Northeast shaped you? The New England landscape made me a well-rounded athlete, literally doing every sport I wanted; however, after falling in love with snowboarding, I had to leave [the rest] behind. Charles Proctor, who designed Alexandria Ski Trail on New Hampshire’s Mount Cardigan and was one of the first two, with John Carleton, to ski Tuckerman Ravine in 1931, competes in downhill skiing. AMC hutmaster Joe Dodge times the 41 competitors in the Eastern downhill skiing trials, a qualifying event held in Tuckerman Ravine for the 1936 games. Three AMC members are appointed to promote the first U.S. women’s Olympic ski team: Alice “Sherburne” Reidy, Thomas Dabney, and Harry W. Hicks. Frederick Gordon, a longtime AMC member whose obituary says AMC “fulfilled his passion for life,” competes on the U.S. hockey team. J. Brooks Dodge, Joe’s son, is the top American finisher in slalom. Penny Pitou, a longtime AMC member, becomes the first American skier to medal in the Olympic downhill event.”I hike in the Whites all the time and have done so for over 40 years. My father gave me my first AMC White Mountain Guide in 1952,” Pitou says. Charles Kellogg, a hut croo member for five seasons, competes on the U.S. biathlon team. Joe McNulty, who helped AMC cut Wildcat River Trail in the Carter Range, competes in cross-country skiing. John Morton, an AMC member and repeat Olympian (competitor in 1972 and ’76, coach and team leader 1976–2002), joins the ranks of biathlon’s elite in New Gloucester, Maine. “I began hiking AMC trails in 1960 as a member of the Tilton School Outing Club. In those days, the Sunday Outing Club hike was one of the only opportunities to get off campus,” Morton says. Jennifer Wehunt is the editor in chief of AMC Outdoors.